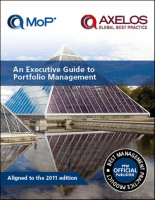 This guide is about Portfolio Management and is specifically aimed at Project and Portfolio professionals. The subject is discussed from a strategic perspective. This guide will help you understand how Portfolio Management can assist in addressing the challenges you and an organization face and how to respond to the demands for more customer focussed service. Find out more about Accredited MoP® training.